Nicola Corea first appears in the Painesville, Ohio, area in 1914. In America, Nicola Corea was known as Nick Corea. Nicola Corea was born on June 22, 1893, at Selia Marina, Italy. He married Caterina Costantino. Nicola Corea immigrated to the United States on June 25, 1914, at age 21, travelling to Painesville, Lake County, Ohio. He was joining his brother-in-law, Domenico Parrottino, in Painesville. 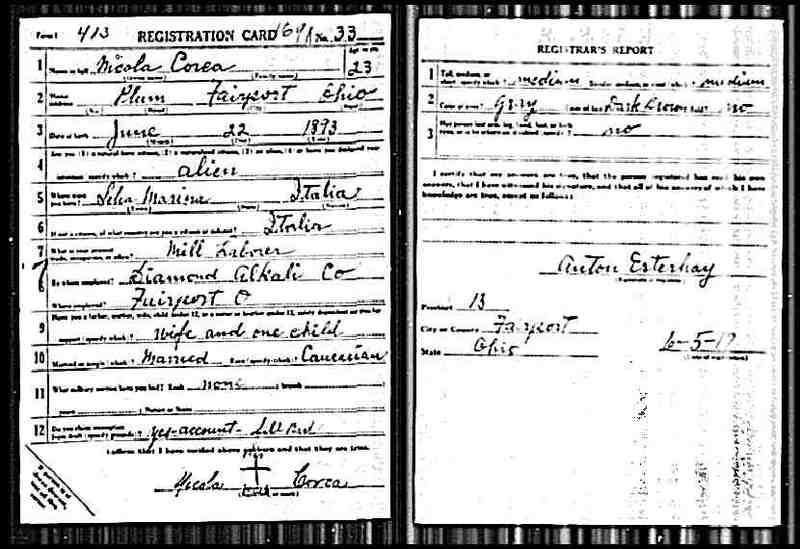 Nicola Corea registered for the World War I Draft on June 5, 1917. He was living at Plum Street, Fairport, Lake County, Ohio. Nicola was employed by the Diamond Alkali Company. He was enumerated for the 1920 Census of the United States, on January 22, 1920, living at Seventh Street, Fairport Village, Ohio. He was a boarder of Carlo Colantuono. Nicola left Painesville sometime after 1920.